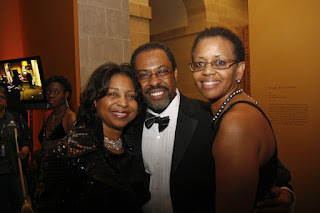 I was blessed to be hired to photograph an Inaugural Event at The Smithsonian Museum of African Art on Inaugural Eve. I took my tuxedo with me to D.C. because this was a semi-formal affair, but I wanted to look impressive. I didn't know who was going to be there, so it was better to be PREPARED...just in case. As the guests started arriving, and eating the hors d'oeuvres , and drinking the wine, I thought it was going to be another "starched shirt" "stuck up" affair. Once the program got started , and the Honored Guests spoke, it was time to PARTY!!!! 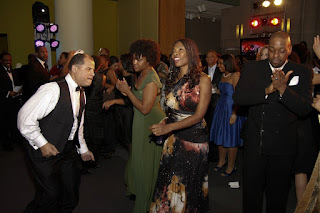 The guests let their hair down, loosened the ties and danced the night away. I met many people from all over the Country, and even exchanged cards with some folks. The photos above are from the event, and if you want to see them all, there is a link on the right side of this page under LINKS. 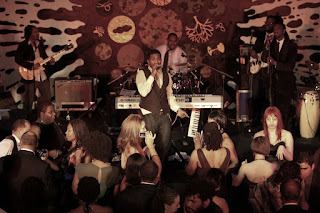 I had to take my bow tie off and interact with the crowd all night...I had a BALL.